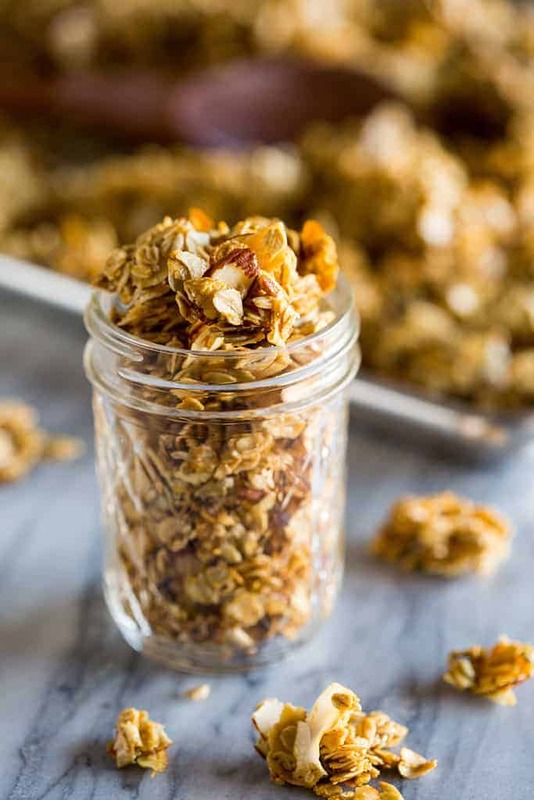 A homemade healthy Granola recipe that is incredibly easy to make and perfect for a quick breakfast or snack idea. At just 100 calories per serving you can feel good adding this granola to your morning yogurt, or even eating it plain with a bowl of milk. 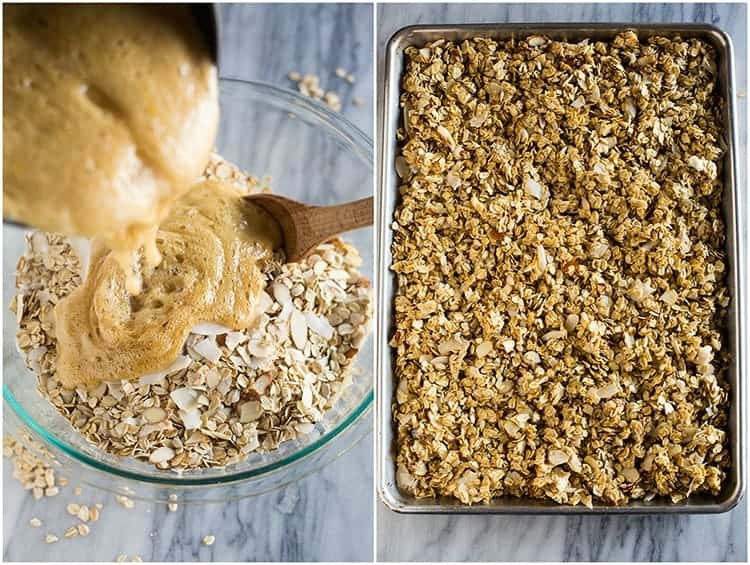 I’m completely obsessed with homemade granola, especially this healthier version that actually tastes good! I got the recipe from a family friend–thank you Glinda Straddeck! I eat it pretty much every morning on my breakfast, which consists of light Greek yogurt with a scoop of cottage cheese, some berries or bananas, and a handful of granola. I never get sick of it, and I love how filling it is! Most store-bought brands of granola are around 200 calories per serving and are full of sugar. 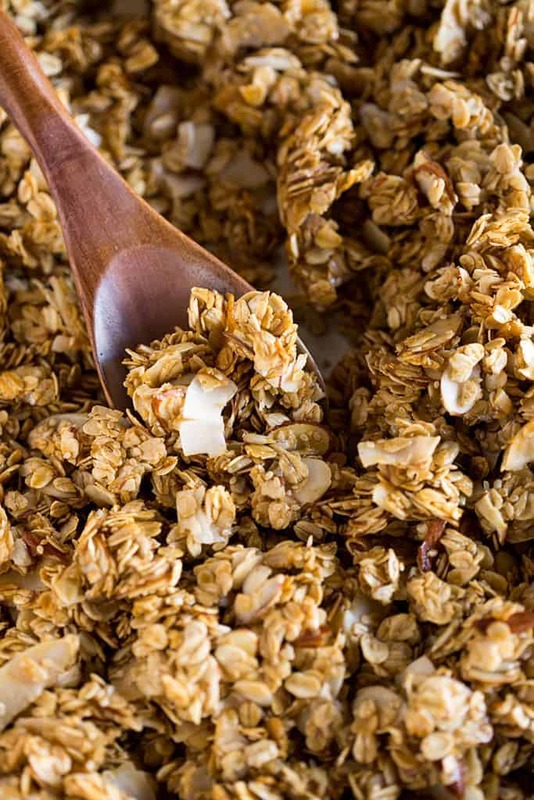 This homemade granola recipe has just 100 calories per serving! I like to make a big batch of it and store it in my freezer. Granola is a snack of breakfast food containing oats, sunflower seeds, sesame seeds, shredded coconut, almonds, and other desired ingredients. 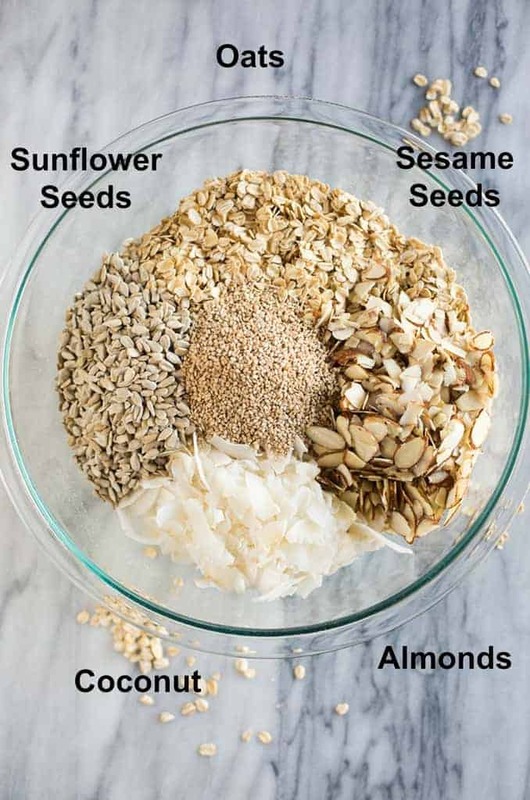 Add all of the dry ingredients to a bowl: whole grain oats, sliced almonds, sunflower seeds, raw sesame seeds and raw unsweetened coconut flakes. Make the syrup by combining the butter, sugar, honey, salt, and vanilla in a saucepan. Cook the mixture until it boil, then remove it from the heat and stir in the baking soda. Pour the syrup over the oat mixture and toss everything to evenly coat it. Pour the mixture out onto a parchment lined or greased baking sheet and bake it for about 18-20 minutes, tossing once during baking. Allow the granola to cool completely in the pan to allow it to harden up and create those clusters of granola that we all love. The key to understanding if granola is healthy or not is the sugar content! Many granolas are packed with added sweeteners. If you then serve granola over sugary yogurt or with a bowl of berries, you really up the sugar content. The serving size of granola is small because it can be high in calories. This recipe has an estimated 5 grams of sugar per serving (1/4 cup). Also consider whether the recipe contains whole grains (fiber) and protein. This recipe has a gram of fiber and two grams of protein in each 1/4 cup serving. Make granola into trail mix by adding some dried fruit mix-ins. Add granola to a yummy salad! 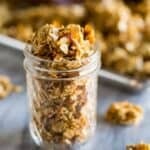 A homemade healthy Granola recipe that is incredibly easy to make and the perfect quick breakfast or snack idea. Preheat oven to 315 degrees and spray a large sheet pan with cooking spray, or line with parchment paper. Add all dry ingredients to a large bowl: oats, sunflower seeds, coconut, almonds, and sesame seeds. Stir to combine and set aside. Make the sauce by adding butter to a large saucepan. Melt the butter over medium heat. Add all sauce ingredients EXCEPT baking soda. Bring the mixture to a boil and once boiling, remove from heat and stir in baking soda. Pour immediately over the dry oat mixture and toss to evenly coat everything. Pour mixture onto prepared pan and spread into an even layer. Bake for 8 minutes. Remove from oven and toss mixture, then gently press down on it with your spatula to flatten it back into the pan. Bake for another 8-12 minutes until golden. For best results and yummy "clumps" of granola, allow the granola to cool completely in the pan before stirring or breaking it up. This recipe yields about 8 cups of granola. Serving size is 1/4 cup. Store leftover granola in an airtight container or freezer-safe ziplock bag for up to 3 months. *This post contains affiliate links. I love sharing my favorite products with you. I saw you post this on Instagram last week and I knew I had to make it. It turned out AWESOME! All of the ingredients were easy to find except the brown sesame seeds which I ended up finding at a natural foods store in their “bins”. I love that it made a big batch so I froze the extras, like you suggested. Thank you! Great recipe! Easy to make and delicious!! I found this by googling healthy granola and chose it because it also said easy. I made some substitutes (gluten free oats and added a few pistachios because I didn’t have sesame seeds). I hate to admit it, but I forgot the baking soda/aka didn’t have any…oops. The granola turned out just fine. Thank you! Im so glad you liked it, and thanks for sharing your adaptions! Absolutely love this granola. Easy to make. Tastes delicious!